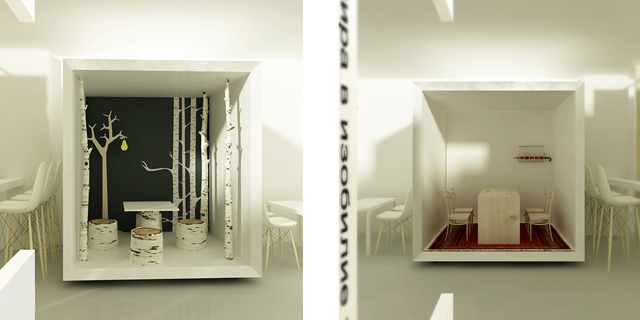 The idea for this project started as a concept for an interior design contest for a Terry Pratchett inspired café. The owners of the café simply wanted pictures from around the world on the walls, but we decided that the impression of travelling (through Pratchett's universe) could be better expressed through an integrated designed experience of food, drink, space and sound. Even though the project was nominated, it did not get chosen as a winning design. However this doesn't mean that the idea shouldn't be turned into reality! That's why we are sharing it with you - to develop it further and beyond the contest theme and into something that will be created with the collaboration of imaginative and ambitious café or restaurant owners and culinary enthusiasts. As architects and interior designers, we love to create meaningful spaces that enhance positive experiences through creative and “outside-the-box” thinking. Therefore, the idea is to create a fully designed culinary experience in a space that guides clients through various types of “journeys” - be it geographical, cultural and seasonal. In other words, we want to design a café or diner that highlights contemporary food, culture and life of various places around the world. We want to work together with someone who is inspired by the idea of a fully designed culinary experience and who is searching for such ideas/concepts for their own start-up café/ dining business. Our work would only involve the space design and collaborators would join in with culinary and business conceptualization. So, we want collaborators to design the project together with us.